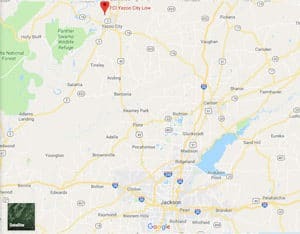 Location: FCI Yazoo City Low is located 36 miles north of Jackson, Mississippi, off Highway 49. Background: FCI Yazoo City Low was opened in 1996. The camp was opened in 2001. Both facilities are part of the Yazoo City Federal Correctional Complex (FCC). Notable inmate, singer Karey Lee Woolsey (serving 13 years for attempting to distribute more than 7,000 pounds of marijuana in Florida), released an album while he was in prison that reached a top 10 ranking on Billboard charts. Housing: Inmates are housed in one of six housing units which are separated into dormitories consisting of two-person rooms. Camp prisoners are housed in dormitories. Health Services: FCI Yazoo City Low provides primary health care for acute and chronic conditions including diagnosis, treatment, education, and counseling for inmates. Physical examinations, dental services, pharmacy services, immunizations, and special care items (e.g., eyeglasses) are provided. Inmates are assigned to a primary care provider who will treat them for the duration of their stay. Emergency medical care is available 24 hours a day by approaching any staff member and requesting assistance. Psychology Services: Psychology services include intake screening, crisis intervention, and individual and group counseling. Group therapy tends to include anger management, HIV/AIDS Awareness, criminal thinking, and others. Notices of upcoming treatment groups are posted in inmate housing units. Suicidal inmates can approach any staff member and request to be seen by a psychologist. Emergency care is available 24 hours a day. Residential Drug Abuse Program (RDAP): FCI Yazoo City Low houses a Residential Drug Abuse Program (RDAP). The camp does not house a Residential Drug Abuse Program (RDAP). A Drug Education Class and Non-Residential Drug Abuse Treatment Programs (NR-DAP) are also offered. Education Services: FCI Yazoo City Low provides literacy, GED, and English-as-a Second Language (ESL) programs. An incentive award of $25.00 will be given to inmates upon completion of the GED, ESL, or apprenticeship programs. Adult Continuing Education (ACE) classes and other special interest courses are taught by inmates. A Release Preparation and parenting classes are also available. High school diplomas and post-secondary programs are available through paid correspondence programs. Advanced Occupational Education: FCI Yazoo City Low does not offer any advanced occupational education programs. Vocational Training: At FCI Yazoo City Low vocational training is available in Microsoft Office, Cabinetry, Restaurant Management, Drafting, AutoCAD, and Heating and Air Conditioning. The camp does not offer any vocational training. Apprenticeship: FCI Yazoo City Low offers apprenticeships in Cabinet Making, HVAC, Teacher’s Assistant, and Custodial Maintenance. The camp does not offer any apprenticeships. Library Services: Leisure and law library services are available for inmates. In the leisure library inmates can check out newspapers, magazines, and fiction and nonfiction books. In the law library inmates can use a copy machine, typewriters, and the TRULINCS Electronic Law Library. The law library is located in the Education Department. UNICOR: The FCI Yazoo City Low UNICOR facility produces clothing and textiles. Commissary: Inmates receive a spending limit of $360.00 per month. Inmates are allowed to shop once a week on their designated shopping day. Shopping days rotate quarterly and the schedule is posted at the commissary. Items such as food, beverages, clothing, and electronics can be purchased. Recreation Services: FCI Yazoo City Low offers both indoor and outdoor activities. Indoors inmates can play board and card games, paint, draw, and engage in other art and crafts projects. Outdoors, inmates can exercise, play sports, walk or run on the track, and participate in a number of structured and unstructured activities.